Today I spent about four hours working with my new artist friend, Phil, at Arts Benicia hanging this year’s Arts of the Community Show. I learned so much today. I was partnered up with Phil since he is the pro and I’m a newbie, and he did most of the work while I held the paintings and tried to keep up with all the mathematical calculations. The idea is to keep the center of a pair of vertically hung paintings at 56″ from the floor. So you have to add the length of the two paintings (or three, or one), add two inches to four inches for the space between them, divide by two, find the center, find the measurement for where the wire hangs and . . . well, you get the idea. Even with a calculator, I’m still mathematically challenged, so I was lucky to have Phil there to help me get the hang of things. I learned that the larger of a pair gets hung down at the bottom so the top doesn’t look heavy. And that you have to hang a pair so that they’re centered with the paintings beside them. I know it sounds complicated, but it’s not so bad, really. The best part was getting a preview of all the amazing art work, although I didn’t get too much of a chance to look around. The exhibit runs from January 21 – February 26, so if you’re in the area, I encourage you to stop by and have a look. You can find directions, hours, and other info at the Arts Benicia web site. This is my third year (I can hardly believe it!) showing art work at the community art show. Every year I’ve shown something different. 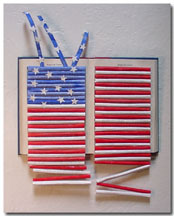 The first year I had two pieces that were assemblage and collage on book covers. The second year I showed three of my Reliquaries. I got a lot of positive comments about those. There was nothing like them at the show. This year I made three book sculptures; they are different from anything I currently have on my web site. They are pretty dark and serious. I used a lot of found objects, burning, tearing, painting. They were so much fun to make but very time intensive. My husband doesn’t know what to make of them, and my youngest son says they creep him out. My oldest son says they’re”sick,” which is supposed to be a good thing. So overall, I’d say response from the family has been fairly positive! Going to the artists’ reception for the show is crazy. The gallery is pretty small and it’s always packed with people. You have to nudge your way around the room. It’s a good time to schmooz and meet new people–not really my strong points, although I’m really going to make an effort this year. After I look at all the other art work, I like to hang-out non-chalantly by my pieces and eavesdrop on peoples’ conversations. I love hearing reactions to my work. This year should be the best. I’m sure there will be a variety of lovers, haters, and people who are just plain puzzled. I can’t wait! Well, I’m batting one for three so far. During August I had submitted entries to three juried shows. First I got rejected for the Book Arts show in Oregon. I was disappointed, of course. But then, about two weeks later, I got a call saying that two of my pieces, Saraswati :: Saraswati Reliquary and Contemporary Wall Sculpture :: The King’s Garden had been accepted for an for the San Luis Obispo Art Center. The artist reception is October 15 from 6-8, and the exhibit runs through November 13th. As you can imagine, I was thrilled to get accepted into my first show. Now I have to figure out how I’m going to package The King’s Garden and send it down there safely. Having been accepted into that show softened the blow of the rejection letter I received the following week from the Roseville Art Gallery. They turned down my three Dia de los Muertos altered books. Last time I wrote about being rejected for a show, I had so many nice people write to offer their encouragement and support. Thank you all so much for that. I’m heading to Reno this weekend to watch the Grand Finale of the 2000 Supermoto Bike Series. It’s not exactly my first choice of events to attend, but my son and husband are into that, so I’m going along for the great seafood platter and ciopinno they have at the Atlantis Hotel where we’ll be staying. I’m not the gambling type, but if I can find a $1 blackjack table, I’ll play for hours. Do they still have such a thing?? I haven’t been keeping up with the blog lately because I’ve been trying to tie up some lose ends on my web site. Wait!! Back-up. Erase that. I promised myself that I would never be one of those blog apologists. Sorry. I won’t do that again. . . Moving right along . . . 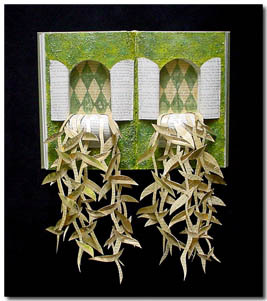 I have finally added three more book sculptures to my Wall Hangings Gallery. I am particulary proud of the one on this page: Handmade Paper Sculpture :: Anatomy of Paradise. I started it right after school got out last June, but then my mother’s alzheimer’s suddenly got a lot worse, and I was spending two to three days every week driving to my parents’ house and helping out my father. Coming back home, I’d always have a ton of stuff to catch-up with, and not only that, I didn’t really have the energy to devote to this book. It languished on my table, taunting me to come back and get it finished. But I just couldn’t bring myself to do it. Finally in August, with the summer slipping past, I was able to pull all the many pieces of this book together. 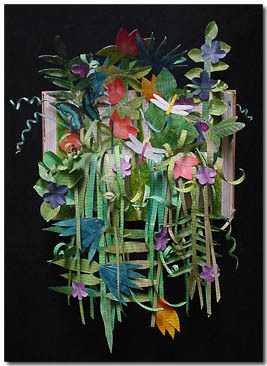 Flowers, leaves, dragonflies, hummingbird, butterfly, tendrils and vines were blended together to grow out of the book. I’m so happy with the way it turned out. Unlike so many other pieces of art that I do, this one turned out just the way I envisioned it in my mind. I have just completed everything I needed to do to enter my first juried exhibition. And I’m even ahead of the deadline! What a surprise. There were a lot of guidelines to follow. I had to read and re-read, underline, take notes, and I’m still paranoid that I missed something and will be summarily rejected. This exhibition is specifically for the Book Arts, so I have decided to enter four of my Wall Hangings. I figure that it is likely that most of the book arts submissions for others will need to be on tables or pedestals; I hope that that will leave plenty of wall space for my four entries. The first thing I had to do is decide which book sculptures to send. There are a few that I worry about traveling, so I decided to choose ones that I thought were my best work and also would go through the mail in one piece. I decided on Paper Art :: Rising to the Occasion, Decorative Wall Hangings :: Dream Weaver, Contemporary Wall Decor :: Stone Heart, and Paper Sculpture :: Land of My Heart. I could have submitted one more, but I really didn’t want to pay the money. Even though this is a non-profit art organization I’m submitting to, and the fees are relatively low, I don’t like the idea of having to pay a fee that doesn’t come back to me if I get rejected. Seems like a weird way to run things. Wouldn’t it make more sense to pay a fee if you get accepted? But who am I to say? From of the looks of things, that seems to be the way it’s done. So after I decided which books to submit, I had to make a CD with up to four digital images of each book. That wasn’t too hard because I have images on my computer for use on my web site. I had to organize and name them a in a specific format. Again, not too difficult after I got the hang of it. I was grateful that I didn’t have to send slides, since I don’t have any. I am considering entering a arts and crafts’ exhibition in San Luis Obispo, and I will need slides for that. I’m looking into creating slides from my digital images. Everything I read says that I should invest in professional photographs of my art, but I can’t even consider that right now. I know that if I was running my “art business” as a “real” business, I would invest the money, and it would be a worthwhile expense. I mean, if my art doesn’t come across effectively in slides and photos, who’s going to want to buy it anyway? So some day soon, I hope I’ll be in a position to have this done. Along with the digital images, I had to include a Word or PDF doc giving my name, the title of the work, the media used, and the selling price. This gallery is only charging a 25% commission, which is really reasonable compared to others I’ve seen. Most places charge 40 – 50% commission. It’s hard to keep the selling price down. I mean, the retail price on those four pieces is only $125 each, which I think is pretty low to begin with. If the gallery keeps 50%, then I’m down to about $55 for each piece. Subtract the entry fee – about $5.00 each. Subtract the cost of shipping the work to the gallery and then shipping it home if it doesn’t sell. Boy, when you start looking at it that way, I’m really underpricing my art! Next I completed an entry form. I also enclosed a very brief cover letter, although I wasn’t asked to. It seemed weird to just stick everything in an envelope and send it without a note of some kind. One of the resources I’m using to figure all of this “art biz” stuff out, is a book called Building a Career as a Visual Artist: Taking the Leap. It has a couple of examples of how to write a cover letter which gave me some good ideas about what to write. Cay does say to use some nice stationary–nothing flowery or cutesy–so I had to make some using my computer. I think it looks okay. Simple but nice. This book has really been helpful to me. It’s very clear and easy to read and basically answers all my questions before I even think of what to ask! Finally, I filled out a SASE (self-addressed stamped envelope) so they can return the CD if they don’t like my work, and I plan on getting the whole shebang to the post office tomorrow. Check back to see how it all works out!